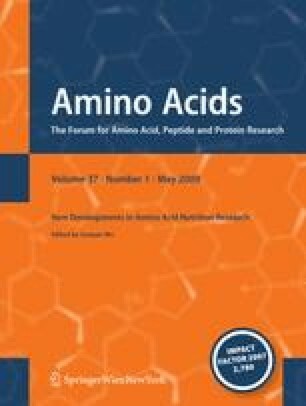 Recent years have witnessed the discovery that amino acids (AA) are not only cell signaling molecules but are also regulators of gene expression and the protein phosphorylation cascade. Additionally, AA are key precursors for syntheses of hormones and low-molecular weight nitrogenous substances with each having enormous biological importance. Physiological concentrations of AA and their metabolites (e.g., nitric oxide, polyamines, glutathione, taurine, thyroid hormones, and serotonin) are required for the functions. However, elevated levels of AA and their products (e.g., ammonia, homocysteine, and asymmetric dimethylarginine) are pathogenic factors for neurological disorders, oxidative stress, and cardiovascular disease. Thus, an optimal balance among AA in the diet and circulation is crucial for whole body homeostasis. There is growing recognition that besides their role as building blocks of proteins and polypeptides, some AA regulate key metabolic pathways that are necessary for maintenance, growth, reproduction, and immunity. They are called functional AA, which include arginine, cysteine, glutamine, leucine, proline, and tryptophan. Dietary supplementation with one or a mixture of these AA may be beneficial for (1) ameliorating health problems at various stages of the life cycle (e.g., fetal growth restriction, neonatal morbidity and mortality, weaning-associated intestinal dysfunction and wasting syndrome, obesity, diabetes, cardiovascular disease, the metabolic syndrome, and infertility); (2) optimizing efficiency of metabolic transformations to enhance muscle growth, milk production, egg and meat quality and athletic performance, while preventing excess fat deposition and reducing adiposity. Thus, AA have important functions in both nutrition and health. This work was supported, in part, by grants from National Institutes of Health (1R21 HD049449), National Research Initiative Competitive Grants (2008-35206-18764, 2008-35206-18762, and 2008-35203-19120) from the USDA Cooperative State Research, Education, and Extension Service, American Heart Association (#0755024Y), and Texas AgriLife Research (H-8200). The author thanks graduate students, postdoctoral fellows, technicians, and colleagues for their important contributions to the work described in this article.